Featured on the Front Page of USA Today. <?xml:namespace prefix = o ns = "urn:schemas-microsoft-com:office:office" /> Production evo.pens, and 24 other models and prototypes were accessioned into the permanent collection of the Smithsonian Institution. Lectured about by Ms. Mary Benbow, author of the chapter "Principles and Practices of Teaching Handwriting," in the Mosby medical text Hand Function in the Child. Installed throughout the exhibition in the Henry Dreyfuss Ergonomic Design Exhibition held at the Cooper Hewitt Design Museum in New York, for visitors to use in signing and writing. The pen has sold in the Museum of Modern Art Design Store continuously for over 15 years. Currently the Museum sells the evo.millennium and black cartridges. 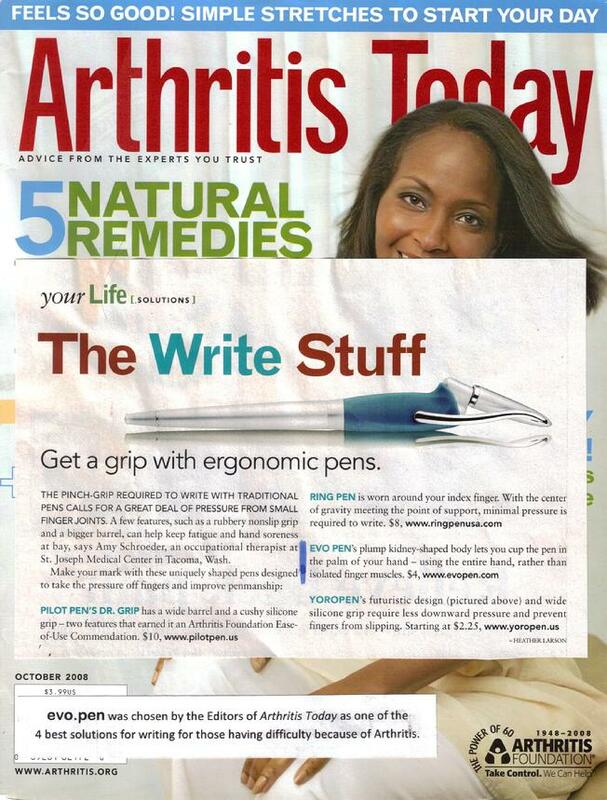 Chosen by Arthritis Today Magazine (2008) as one of the �Solutions� to writing for those with Arthritis. Lectured about by Ms. Lindsay Biel, Author of "Raising a Sensory Smart Child," and is used in school systems throughout the world. House & Garden chooses the evo.millennium to help those with writing difficulties. The first pen to receive a Commendation. Pen World Magazine chose the evo.millennium as a featured gift in their in the magazine's 2010 Holiday Gift guide.